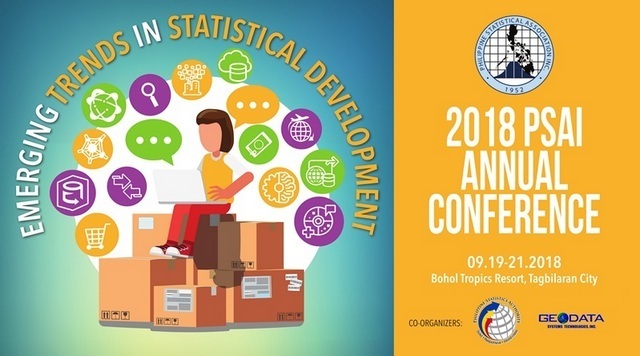 As the country holds its ground in global conversations on emerging developments such as open data, big data platforms and data science analytics, the Philippine Statistical Association, Inc. (PSAI) takes pride in responding to the ever changing data landscape by adopting the theme "Emerging Trends in Statistical Development" in its 2018 Annual Conference which was held at the Bohol Tropics Resort, Tagbilaran City, Bohol on September 19-21, 2018. The theme is also in consonance with the collective effort of professional social science associations under the Philippine Social Science Council, Inc. (PSSC) which is celebrating its 50th Founding Anniversary in commemoration of the social science legacies in these changing times. Treading on the crossroads of proposed changes in national and local governance, this year's Annual Conference prompted discussion on what the technology can bring. As such, it is perceived to be widely responsive to a wide range of topics of current interest. In partnership with the Geodata Systems Technologies, and the Philippine Statistics Authority, the Annual Conference provided an opportunity to respond to the challenges posed by emerging technologies. The event also featured the Student Best Paper Competition now on its 3rd year which is being undertaken with the support of the Philippine Statistical Research and Training Institute (PSRTI). Training participants are enjoined to bring their own laptop computers. Professionals from public and private sector, academe, and all other interested parties were invited to prepare papers and participate in this Conference and attend the trainings. Participation in the Training and Conference helped both the practitioners and the uninitiated at the national and local levels to better appreciate and respond to the challenges and opportunities that used to be the enclave of data science enthusiasts. A student paper session was conducted as a pre-conference activity. Papers prepared by undergraduate students from higher educational institutions, individual or group, relevant to the topic were submitted and evaluated based on the relevance to the conference theme. Presenter of winning papers were given travel allowance and hotel accommodation to attend the conference and to present the paper. Gawad Estadistika is a new award which will be given annually beginning 2017 to recognize an individual or group/institution that made the most significant contribution towards the development and intensified use of statistics in line with the PSAI's mission and vision. Deadline for submission of nomination form is on 31 May 2018.